Let’s take a look at how the real estate market in Clark performed in August of 2018. In July, 45 single family homes were sold and 88 homes were offered for sale, down from 102 homes offered for sale in June and compared to the 12 month average of 80 homes offered for sale. 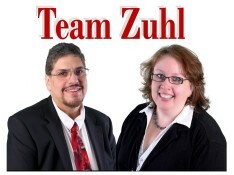 To search for listings, please click here. More homes are offered for sale in the spring and summer than in the winter which explains the peaks and valleys in the red line above, the active listings over the last 6 years. 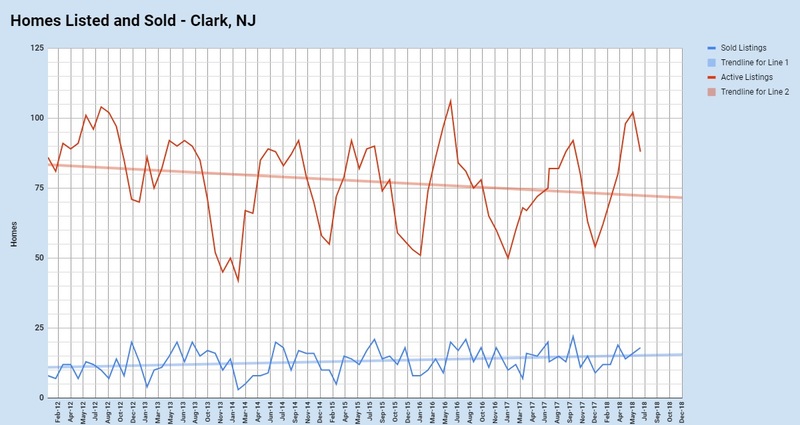 The blue line represents sold listings in Clark over the last 6 years and the straight light blue line represents the trend in sales, eliminating the monthly variation and showing a long term trend of upwards sales. Buyers find Clark attractive, and homeowners benefit in the form of increasing sales prices and decreasing days on market. This is a seller’s market – there are more buyers than there are sellers in Clark – but there is some evidence that the market is slowing down in anticipation of the autumn. The average list price in Clark in July was $555,091 and the average sale price was $501,944, about 8% higher than the 12 month average and 6% lower than June of 2018. Homeowners are continuing to see a strong return on their real estate investment in Clark. When you look at the graph of home prices in Clark, it’s obvious that there are tremendous variations from month to month. As a rule, prices are higher in the summer and lower in the winter due to supply and demand, but of course there are exceptions to this rule. One exception is extreme homes – those that sell for far below or far above the typical home sale in Clark. Short sales, foreclosures and homes in disrepair often sell for less than market average. The important thing to note in the graph is the straight black line which represents the long term trend, eliminating the seasonal variability and the variability brought on from extreme cases. 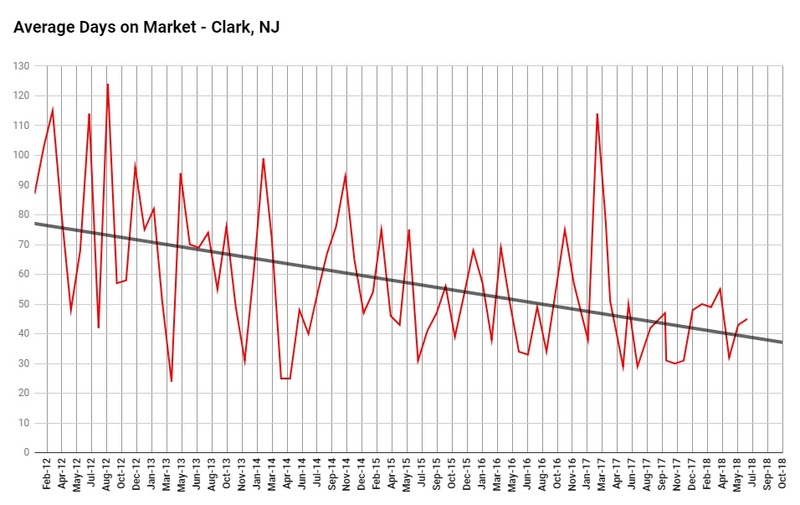 The trend line continues to show a healthy improvement in prices in Clark over the past 6 years and the forecast is for prices to continue to increase. Homeowners are likely to see an increased return on investment as time goes on. One of the questions we’re asked most often is how long it takes to sell a home in Clark. The average sold home in Clark in July was sold after only 45 days on the market whereas the average home sold over the past 12 months was sold in 41 days. Of course, there are exceptions to this rule and the graph’s dramatic variations are indicators of this. The black straight line on the graph is the trend line and it demonstrates the long term trend of the number of days a home takes to sell, eliminating mathematically the variations. The Clark real estate market demonstrates a strong improvement in sales time over the past 6 years.